I couldn’t wait to deliver this 4 tier Naked Wedding Cake for Hannah and George to the beautiful Blake Hall in Ongar, the first time I’d delivered there. Blake Hall itself is a Grade II listed house in it’s own conservation area and in the grounds is a huge original Essex barn where you can hold your wedding breakfast and reception. Just down the lane is the sweet Bobbingworth Church where Hannah and George held their wedding, then strolled back with their guests – wonderful! 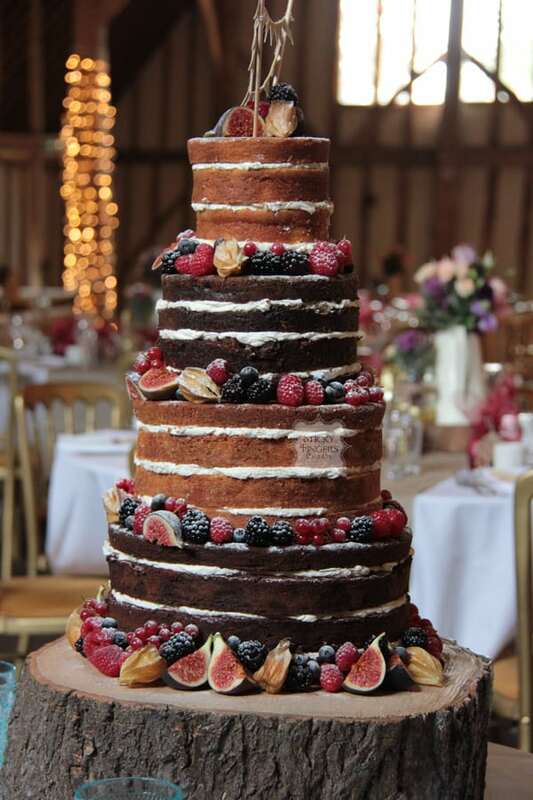 Their Naked Wedding Cake was 4 tiers, decorated with Autumnal fruits, including Physalis fruit and figs. The flavours they chose were Black Forest, lovely lemony lemon cake, carrot and pecan and white chocolate and passion fruit.